You are invited to the GRTS Career Expo being held Wednesday, November 14, 2007, from 9:00 a.m. - noon. Demonstrations, tours, speakers, financial aid info, prizes are just some of the activities planned. You could win a $500 scholarship! A BBQ for lunch will be held outside the shop areas. High school seniors, adults, counselors and parents invited to attend! Please RSVP to 660-646-3414 by Monday, November 12. For more information, contact: Marla Harrington or Debby Peery at Grand River Technical School at 660-646-3414. Computer/Networking Technology includes A+ and Network+ Certifications, Network Installation, Network Cabling, and Network Administration. Diesel Services Technology includes diesel engine overhaul, mechanical fuel injection, electronic fuel injection, hydraulics diagnostics and repair, electrical systems, and electronic controlled hydraulics. Industrial Maintenance includes troubleshooting electrical systems, robotics, predictive maintenance, programmable logic controllers, industrial motor controls, hydraulic/pneumatic power, & mechanical power transmission. 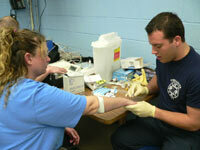 There will also be demonstrations and an explanation of the EMT program, careers & job opportunities. If you are interested in becoming an EMT, plan to attend the EMT session! 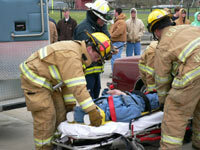 Enter an exciting & rewarding career in Emergency Medical Services! Plan to attend an EMT informative session and workshop, held in conjunction with the GRTS Career Expo & Open House. 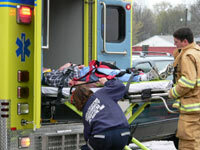 Lives are saved every day due to the quick reaction and competent care of emergency medical service personnel. Caption: GRTS building trades students are shown putting the finishing touches on the 2007 GRTS building trades home located at 1941 Lakeview Drive in Chillicothe. The home features three bedrooms with approximately 1,848 square feet on the main floor and an additional 560 square feet of living space in a bonus room over the garage. An open house was held on Sunday, and the home was sold at auction on Wednesday, May 30. An open house was held Sunday, May 20, for the newest Grand River Technical School Building Trades house which is located at 1941 Lakeview Drive in the Lakeview Estates in Chillicothe. This year's home is described as a beautiful, single story home with a country feel and a convenient location. The 3-bedroom house features approximately 1,848 square feet on the main floor, with 560 square feet of living space in a bonus room above the garage. There is custom oak cabinetry with painted trim throughout the house, as well as a central vacuum system and TV/phone jacks throughout. The home boasts two bathrooms with tile floors and the open kitchen features custom cabinets, oak hardwood flooring and all new appliances. The home includes a breakfast nook and laundry room with a new washer and dryer on the same level as the bedrooms. The laundry room also features custom cabinets. The master bath has a whirlpool tub and shower and two vanities, and there is also a walk-in master closet. The home features vinyl clad windows and 6" seamless gutters with closed cell foam insulation. The home includes a formal dining room, Rinnai tankless water heater, and furnace dual fuel heat pump. Outside the home is a patio measuring 12' x 22', and a storm shelter measures 12'x30' is under the 3-car garage. The garage features two automatic doors, a walk-out door, and an entrance to the basement. The home also includes a direct vent gas fireplace with remote, and the yard will be landscaped with a sprinkler system. "We are very proud of this house constructed by our carpentry classes during the 2006-2007 school year," said GRTS co-director Ron Wolf. Wolf also commended instructors Don Dennis and Chris Todd, as well as the GRTS students for their dedication and hard work. He thanked local building suppliers and local realtors for their support and advice throughout the year. Caption: Rick and Brenda O'Halloran (right) purchased the Grand River Technical School building trades home for a record-setting $240,000 Wednesday night. The home is located at 1941 Lakeview Drive in Chillicothe. The home was constructed by students at GRTS. Instructors Don Dennis and Chris Todd oversaw the construction. 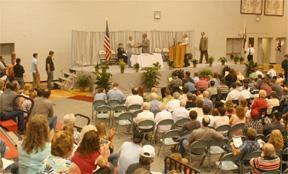 CAPTION: Forty-one students completing programs at Grand River Technical School were presented certificates during 2007 graduation ceremonies Friday evening in the Chillicothe High School gymnasium. The largest program in terms of graduates this year was ag diesel service technology, followed by industrial maintenance technology. In all, eight different programs were represented. Grand River Technical School held its 2007 graduation exercises Friday evening in the Chillicothe High School gymnasium with 41 graduates receiving certificates. Authenticity is equally important so that people know you are dependable, Preston said. She said that every one of the graduates will be a leader of some sort, whether it is a leader of an office group or a project team. The Grand River Technical School is preparing for a visit from a national accreditation team as part of a process to become a nationally accredited technical school. The North Central Accreditation group is comprised of five directors and teachers from other technical schools around Missouri who will examine GRTS' ability to be a technical school. �Basically, we're doing this in order to process Pell grants and provide financial aid for adult students,� Jamie Caughron, assistant GRTS director said. Up to this point, she explained, the school has been accredited through a Missouri School Improvement review - conducted through the state of Missouri. However, due to new federal stipulations, technical schools processing Pell grants (federally-funded money), must be nationally accredited. �If we didn't become an NCA school, we wouldn't be able to process pell grants anymore,� Caughron said. The group's initial visit will happen Oct. 10 and 11 and while here, the group will tour the building, the building trades home currently under construction and the Litton Agri-Science Learning Center. The team will also interview teachers and students and examine documentation relating to different areas, such as school improvement strategies, how the school works with its advisory board members, the tracking of its students and the process of education. �They (the NCA group) will look at everything we do,� Caughron explained. After the NCA visit (within three years), a large group of instructors and directors from vocational schools around the state, will come to the GRTS for a more comprehensive review. �If (NCA officials) give us any tips on how to do things better, we have an opportunity to improve those areas by the time they visit again,� Caughron said. The GRTS school currently has 624 students enrolled for the 2006-07 school year. Of those students, 322 are from Chillicothe High School, 198 are from area schools, 68 are post high students and 36 are satellite students. Beginning Aug. 21, Grand River Technical School (GRTS) and North Central Missouri College (NCMC) will be offering a new technical degree program, which will enable GRTS graduates to continue their education and earn their associates degrees while working full time. �Students will be able to do this right at GRTS, never having to leave Chillicothe,� GRTS assistant director explained. She noted that for the first time at the school, associate's degrees will be available in the following areas: Automotive and Machinery Technology, Construction Technology, Welding Technology, and Manufacturing/Computer Network Technology. Officials at North Central Missouri College and the Grand River Technical School have entered into an agreement which will make it easier for GRTS students to earn their associate's degrees after completing some of the programs currently offered at the GRTS. The agreement is built on the premise that students completing one of seven programs at the school will earn up to 30 hours of college credit toward an Associate of Applied Science Degree. That, according to Roger Wolf, is something GRTS has always offered. Now, however, students who complete a program may continue their education at the GRTS instead of taking the required courses at NCMC to earn their associate's degree, he explained. The classes needed for an associate's degree will be taught at night, Wolf explained, which also makes the idea of continuing education more attractive to students because they can enter the work force after a full year of training at GRTS and then take night classes to earn their associate's degree while working full time. �And students may take those classes in our building, where they feel more comfortable,� Wolf explained. Half of the night courses this fall will be taught by GRTS teachers with NCMC instructors heading up the other half so no new teachers will be hired, Roger Wolf explained. Programs included in this agreement for an associate's degree in Automotive and Machinery Technology are Auto Service Technology, Collision Repair Technology and Diesel Services Technology. Students interested in earning as associate's degree in Construction Technology would first complete the Building Trades program at GRTS. Those interested in earning an associate's degree in Manufacturing Technology - Computer Network Technology - would first complete one of two GRTS programs: Computer/Network Technology or Industrial Maintenance. For an associate's degree in welding, GRTS students would first complete the industrial welding course. Equipment Grant - require local matches of 25 percent and 50 percent, respectively. education in their employment field. Wolf also noted that last year, GRTS boasted 247 graduates. Fifty-seven percent of them were employed in the field in which they were trained and 38 percent went on to continue their education. Only 5 percent of the GRTS graduates were not placed with employers. The Missouri Pre-School Project Grant and the Childcare Development grant each amount to $20,000. According to Pam Miller, preschool teacher and Diapers and Diplomas child care services instructor, the funds used from both grants are used to purchase material and supplies for the preschool and daycare. Diapers and Diplomas is operated by the Chillicothe R-2 School District and students from the GRTS work in the preschool and daycare as part of their classwork. Miller said that GRTS has received the Missouri Preschool Project grant for the last seven years. In fact, the preschool at Diapers and Diplomas was first started with funds from the grant which amounted to $70,000. Miller said that funds from the grants this year will also be used to replace some windows and some vinyl flooring in the facility, located at 1303 Bryan Street. Caption: Dirt work has already begun just northeast of the Agri-Science Learning Center to prepare for construction of a new Livingston County 4-H and FFA Fairgrounds. The new fairgrounds will include several new buildings including a 9,500 square-foot multi-purpose building with a kitchen, a 16,800 square-foot cattle building, two 10,000 square-foot buildings for hogs, sheep, goats, chickens and other small animals and an 8,000 square-foot horse barn. An outdoor arena, a campground and a picnic area are also included in the plans for the new fairgrounds. The Livingston County 4-H and FFA Fairgrounds will move to the Litton Agri-Science Learning Center and dirt work on the new site in north Chillicothe is currently underway. 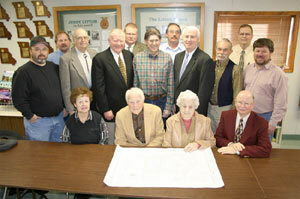 The announcement was made January 18, 2006 during a morning press conference at the Litton Center attended by R-2 officials, representatives of several local foundations, and Fair Board Association members. The project, which is estimated to cost $950,000, will include the construction of new buildings including a 9,500 square-foot multi-purpose building with a kitchen, a 16,800 square-foot cattle building, two 10,000 square-foot buildings for hogs, sheep, goats, chickens, and other small animals, and an 8,000 square-foot horse barn. Officials also announced that an outdoor arena, a campground and a picnic area will also be constructed. Grants from three major local foundations are footing most of the bill for the massive construction project which is expected to commence in full force this fall. Specifically, the Mervyn W. Jenkins Foundation has pledged $600,000, the Jerry Litton Foundation has pledged $250,000 and the Roger A. Browning Foundation has pledged $100,000. Officials have announced that the R-2 school district and fair board are also accepting additional pledges for special projects such as adding additional livestock pens, gates and bleachers. Robert Cowherd, president of the Mervyn W. Jenkins Foundation, remarked that the project was a long time in coming, and he was glad to have work started on it. "On behalf of the Mervyn W. Jenkins Foundation, we are very pleased to make a grant to assist the youth and farming community of the area," Cowherd said. Ed Turner, vice president of the Jerry Litton Foundation, was also on hand for the announcement and noted that the Litton Agri-Science Learning Center is one of only three in the country and termed the relocation of the existing 4-H and FFA Fairgrounds a "perfect fit" with the learning center. "This will lead to more efficient use of the facilities here and expands the presence of the facility which is unique not only in Missouri but across the country," Turner said. He added, "We are proud to work as partners with the other foundations to make this project happen." The county fair and the agricultural department at the Grand River Technical School will use the new and existing facility jointly and, once finished, the multi-purpose building will be made available to the public during the year for rental purposes. Ron Wolf, Grand River Technical School co-director, spoke to the group on the noticeable increasing popularity of FFA and agriculture classes. Specifically, Wolf noted that in 1971, Chillicothe R-2 had 80 agriculture students, 60 of which lived on family farms. Now, Wolf explained, there are over 200 Chillicothe FFA members and only 30 live on their respective family farms. "The need for agriculture and its related careers are still there, which makes it necessary to provide agriculture education to those students who don�t receive it on the family farm," Wolf said. Crawford Construction Company is currently leveling the grounds of the new fairgrounds and putting in existing roads as well as leveling the building sites. Construction bids are expected to be awarded within the next few weeks on the multi-purpose and livestock buildings after the plans for them are approved by the fair board and FFA advisers. The plan for moving the fairgrounds from its site east of town formulated several years ago, but began moving forward in earnest after the fair board voted to pursue the opportunity to move the fairgrounds to a permanent location in September 2004. At the time the vote was taken, the fair board leased the 20-acre facility from the city on a one-year basis. "There were two or three other options (sites) that we explored, but the Litton Center was just the best choice," Jim Schreiner, fair board member and building committee member said January, 17, 2006. He added, "The fairgrounds are for the youth of Livingston County, and the youth will get more use out of it there than if it were anywhere else." The Litton Agri-Science Learning Center currently consists of 36 acres and features a classroom, laboratory, and livestock facilities which are used by agriculture students and FFA members throughout the year. According to Wolf, the future cattle buildings and two small livestock buildings on the fairgrounds will be almost identical in size in terms of square-footage to the ones currently being used at the existing fairgrounds. The multi-purpose building will house the 4-H exhibits as well as an indoor arena where the county's youth will exhibit their animals. The way these buildings are designed, that can be changed," Wolf said, explaining that the livestock buildings may be used to house different species depending on their popularity from year to year. Both Wolf and Schreiner reported that the plans for the new fairgrounds include adequate space for parking, and plenty of areas for campground and picnic sites. The 2006 Livingston County Fair will be held at the current site on U.S. Highway 36 at the Chillicothe Municipal Airport. Caption: The new home built by students enrolled in the building trades program at Grand River Technical School was the site of an open house (Sunday), and a large crowd perused the one-story, 2,100 square-foot home. The home will be sold at an auction on Wednesday at 5:30 p.m.
Caption: Work continues on the house being built by Grand River Technical School's building trades class at 1930 Lakeview Drive in Chillicothe. Brett Griffith and Vern Yost were among several students working on the home today (Tuesday). The house will be on display during a public open house from 1 until 4 p.m. this Sunday and the house will sell at an auction at 5:30 p.m. next Wednesday, May 24. Work was continuing today on the house being built by students enrolled in the building trades program at Grand River Technical School. Last fall the students started with a mere plot of ground in Lakeview Estates and now, some nine months later, a beautiful one-story brick home stands. There were 49 students - both high school students as well as post-high school students - working on the home. The house will be on display from 1 until 4 p.m. this Sunday, May 21, and will be sold at an auction at 5:30 p.m. on Wednesday, May 24. 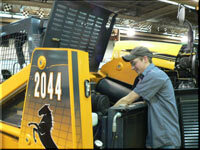 For more information, contact Grand River Technical School at 646-3414. 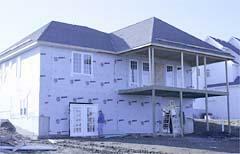 The latest home being built by the Grand River Technical School's (GRTS) building trades students has taken shape in Lakeview Estates in Chillicothe. 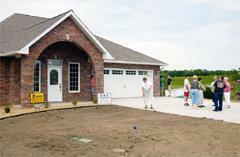 The 2,500 square-foot, three bedroom home is the 39th home built by a building trades class at the GRTS. It will be auctioned off in May. Caption: Approximately 100 people attended the Grand River Technical School building trades home auction last (Wednesday) evening. The home, located on 100 Parkview Circle in the Lakeview Estates, was purchased by Patricia Ann Gray, of Chillicothe, for a record-breaking $224,000. Grand River Technical School (GRTS) building trades home auction brought in the most money ever in school history and sold to a woman who lived just down the street from the new home. Patricia Ann Gray, of Chillicothe, purchased the home for $224,000 during the on-site sale yesterday, at 100 Parkview Circle in the Lakeview Estates. According to Roger Wolf, GRTS co-director, the house brought close to what he and other school officials had expected. "We were very happy that the home sold well," Wolf said. "This is the first house that we've built in that area." The three-bedroom house features a walk-out basement and custom oak cabinetry and painted trim throughout. The home has three baths and an open kitchen with custom cabinets, all new appliances and oak hardwood flooring. The master bedroom has a patio door opening to a large deck and the master bathroom includes a whirlpool tub and a large master walk-in closet. The house has a large great room and a family room in the basement. Wolf estimated that between four to six people seriously looked at the home multiple times prior to the auction. Assistant superintendent Dave May (who is also an auctioneer), sold the home during the auction which drew a crowd of around 100. All proceeds from the sale will go toward paying building expenses and equipment, according to Wolf. The building trades students from Grand River Technical school are busy putting the final touches on a home located at 100 Parkview Circle, before the open house from 1 until 4 p.m. on Sunday, May 22, and the auction at 5:30 p.m. on Wednesday, June 1. According to co-instructor, Stan Baldwin, beginning phases of construction of the home began at the first of the school year in August. Baldwin reported that two recent graduates have come back to help finish the house though they graduated last week. There is a total of 43 GRTS students working on the home. According to Baldwin, the house is about 95 percent done. "We're putting the final touches on everything," he said. Specifically, work on the deck is being completed, along with finishing up the cabinets and touching up paint. The three bedroom house with a walkout basement boasts custom oak cabinetry with painted trim throughout. There is a central vacuum system with television and phone jacks throughout the entire house as well. The home has three baths and an open kitchen with custom cabinets, all new appliances and oak hardwood flooring. There is a 12-by-22-foot maintenance deck with an eating area. The laundry room has a new washer and dryer and on the same level as the bedrooms with custom cabinets. The building trades students from the Grand River Technical School are busy putting the finishing touches on a raised earth-contact home, located on 860 Valle Vista Drive, before the open house from 1 until 4 p.m. on Sunday, May 30 and the auction at 5: 30 p.m. on Wednesday, June 2. According to co-instructors, Don Dennis and Stan Baldwin, construction of the home began a the first of the school year in August. Baldwin reported that several recent graduates have come back to help finish the house even though many graduated last week. "The ones that have come back for the last two weeks don't have to be here," Baldwin said. "They have really picked up and helped out." The construction of the home has been supervised by Baldwin and Dennis and features a total of 2,800 square feet with a large garage. The home has three bedrooms and two and a half baths. 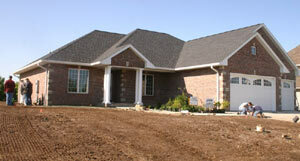 Vinyl siding, a custom stamped concrete driveway and stamped patio adorn the outside of the new home. 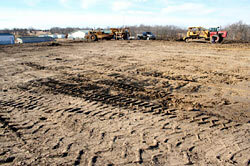 The yard will be completely sodded and and a sprinkler system will be installed in completely the yard. Throughout the house is custom oak cabinetry and custom oak trim which has been made by the students. Baldwin and Dennis reported that there are approximately 45 students who are involved in the construction of the home. The construction of the home got delayed a couple of times due to the rains last fall and a worse than normal winter. However, the students are on schedule again and are working on completing the project. With the open house and auction just over a week away, the students will be busy this week putting the finishing touches on the house. This includes touch-up painting, hooking up the bathroom fixtures, filling nail holes, installing electrical switch plates and cleaning, according to Baldwin. NOTE: Dave May, R-2 school Assistant Superintendent took bids from two serious bidders during the sale of the 2004 building trades home located at 860 Valley Vista Drive in the Christison Addition. The home sold for $162,500!